Unpopular Opinions: Bohemian Rhapsody is TERRIBLE?! 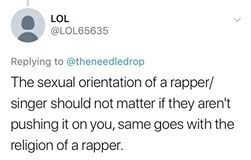 I genuinely find it so hard to argue with this point, a lot of that is to do with the fact that I actually don't like Queen but 'Bo Rap' grates me on a whole other level. I can't stand it. Personally I give Queen quite a hard time but I do quite like "Brighton Rock" thanks to Baby Driver. But everytime I listen to Queen I just can't understand the appeal - I wish I could but when I hear songs like "We Will Rock You" and "Fat Bottomed Girls" I cringe so hard I have to turn it off. I couldn't agree more with this! 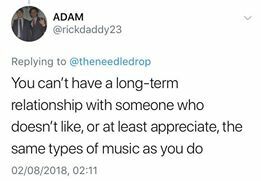 I'm not sure how unpopular of an opinion this really is but my girlfriend and I crossover our tastes in music A LOT and honestly it's brilliant going to gigs with her and having a whole other level of our relationship and things to talk about. Not to mention, it would feel like living a secret life if we weren't to have some of this in common. It's not a MUST, but it really does bring you closer together. 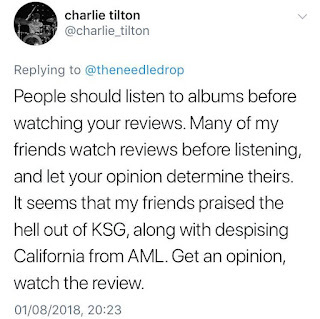 As a reviewer I hate to agree with this because essentially you want people to hear your opinions and to spark debates regarding all of these albums that you've liked or loathed and to add to the music community. However, I think it's so important to listen to a piece of music and garner your own opinions on the subject before seeing what someone else thinks. It's like having dessert and then having your starter and then your main meal. It doesn't feel write and you can't understand some of the things that they point out or elaborate on because you haven't heard the album. 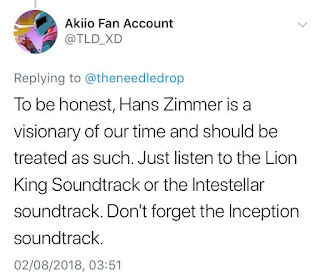 So I think one listen is enough, form an opinion, then go back and listen again whilst taking on this different way of looking at things and develop a deeper understanding of the music. I was loving the sentiment of this until I saw the ""IF"". Let's deal with the first bit first though. I could not agree more! I can't imagine disliking music because of the sexual orientation of the person, it's genuinely one of the most closed minded things I could ever dream of. For example, I'm a big fan of Years & Years' debut album, that album was huge to me when it first came out, I listened to it daily in the car - to be robbed of the way that album made me feel because of prejudices blows my mind. More recently I've become a humongous fan of Christine & The Queens who's music I find so powerful, enlightening and inspiring. And despite her sexual orientation - which I'm not even 100% sure of because it doesn't matter - I relate to the music and it's truly wonderful. If you've not discovered her yet (Not sure how you wouldn't have considering "Tilted" was EVERYHWERE a few years back) I feel like I haven't got my point across very well here, but the main point is that if you don't listen to music because of someones sexual orientation then you're a bigot. Simples. This is wrong. Look. I love Kanye but Yeezus is by far his weakest album and I barely ever revisit it anymore. 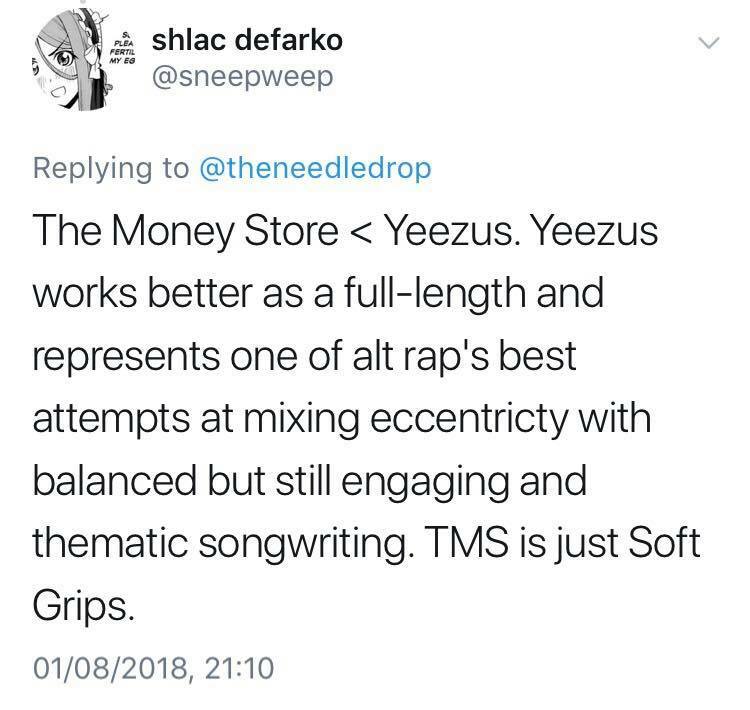 Whereas The Money Store was the highlight of Death Grips' discography in my honest opinion and I'm not going to sit here and pretend to be a Death Grips stan, but I respect that album for how imaginative and inventive it is as a whole. 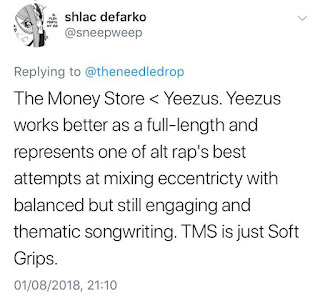 If I had to pick one to listen to as I'm writing this then I would pick The Money Store and I feel that's a pretty good way of choosing - they're quite different albums though. YES! 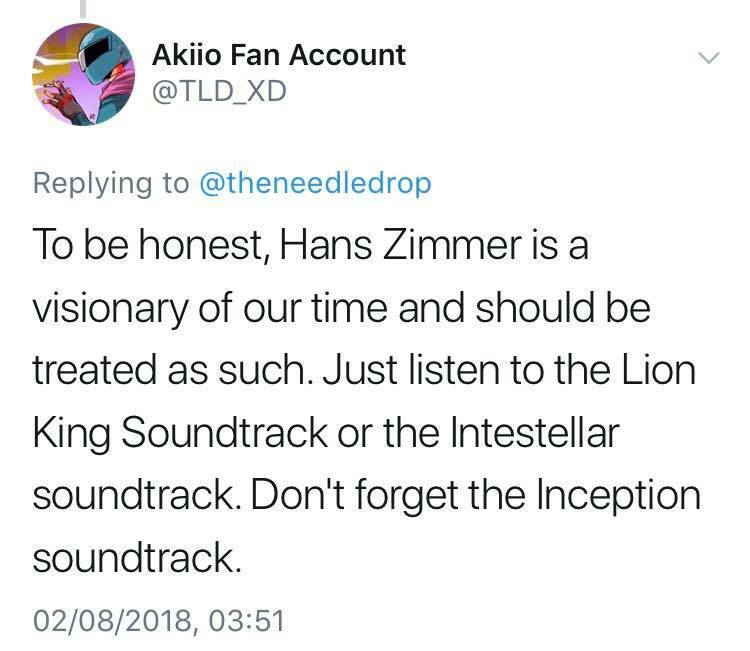 The Interstellar OST is actually magic, give it a listen and if you haven't seen the film. SHAME ON YOU. I don't even know how I feel about this because on one hand I find GKMC so much more enjoyable to listen to and often revisit the tracks on it. However, I respect TPAB on a whole other level musically - I actually find it awe inspiring how truly good it is. If I were to introduce someone to Kendrick's music then I would play GKMC without a doubt. 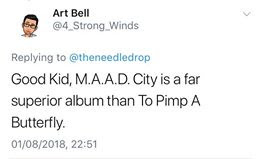 However, if I believed that someone was really into music and willing to actually listen to a project, soak it in, believe it then I would play them TPAB - there's no doubt that they are both fantastic albums but as an album To Pimp A Butterfly is better in my opinion. There's just so many layers to the record, there's elements of funk and jazz whilst staying true to its hip-hop roots. And the song "How Much A Dollar Cost" blows my mind everytime I give it a spin.